Royal City Swing's Anniversary and Valentine's Day Dance! Live music by Swing Patrol! With a great group of dancers, a solid team of volunteers and so many talented DJ's and instructors, Royal City Swing is thrilled to be celebrating 8 years of weekly Swing dances! Come celebrate with us! Theme : Dress to impress! with DJ Trilby and DJ Dino-myte! Dress Code: Prohibition Formal - get gussied up in your finest formal wear! Vintage styles from the Roaring Twenties and the Dirty Thirties encouraged! No Jeans or Running Shoes. PLEASE BRING INSIDE/DANCING SHOES. There will be a coat and shoe check for outside shoes. This is a special event and you must dress up! Casual wear will not be accepted at the door. If you have any questions, please ask! 10:00pm - 2:00am - Social Dancing and Celebrating! Food and Drink: There will be light appetizers and finger foods available, included with admission. There will be a cash bar serving beer, wine and spirits. Location: 100 Braid St Studios. This 1929 Heritage Warehouse is the last standing building of the BC Distillery. Cocktails were made in this location to supply liquor to the US during prohibition so we can’t think of a better place to hold our event. Tickets are limited in number so please be sure to purchase early! By Skytrain or Bus: Expo Line Production Way-University: Braid St Station. 100 Braid St Studios is about a three minute walk across the street from the Braid St Skytrain station. The station is the major interchange with skytrain for many Coquitlam and New Westminster bus routes. Royal City Swing's Annual Ugly Christmas Sweater Dance! Live music from the NWSS Senior Jazz Band! Royal City Swing, in partnership with the City of New Westminster, invites you to join us for a summer night of outdoor dancing at New Westminster Pier Park! We’ll have a dance floor, a tent to cover you from sun or rain, and two DJ’s. Royal City Swing's 7th Anniversary Dance! With a great group of dancers, a solid team of volunteers and so many talented DJ's and instructors, Royal City Swing is thrilled to be celebrating 7 years of weekly Swing dances! Come celebrate with us! Join us for our New Year's Eve party!! Tickets: $25 (cash only). Tickets are available through Afonso. Limited number available - come and see him at RCS on Fridays if you want to reserve a spot! Location: 100 Braid St Studios is a 5 minute walk from Braid skytrain station and also has a ton of free parking in the back. Food and Drink: There will be light appetizers and finger foods available, included with admission. There will also be a cash bar serving drinks. Royal City Swing's Annual Ugly Christmas Sweater Dance! with live music by Eva and the Jazz Cats! with instructors Afonso and Kate. with DJ José and DJ Kastle! A fun-filled night of spooky tunes and great dancing awaits. Make sure to wear your best Halloween costume to the Halloween Sugar Push for your chance to win some awesome prizes. This festival is the largest one day food truck fest in Canada, featuring 150 vendors, 8 beer gardens and live music along Columbia Street in historic Downtown New West. Plus Royal City Swing will be there spinning tunes for your street dancing pleasure! We will have beginner dance lessons, shim sham performances and more! Keep in mind this is an outdoor festival so come prepared! Royal City Swing's 6th Anniversary Dance! Live music by Swing Aggregation! With a great group of dancers, a solid team of volunteers and so many talented DJ's and instructors, Royal City Swing is thrilled to be celebrating 6 years of weekly Swing dances! Come celebrate with us! 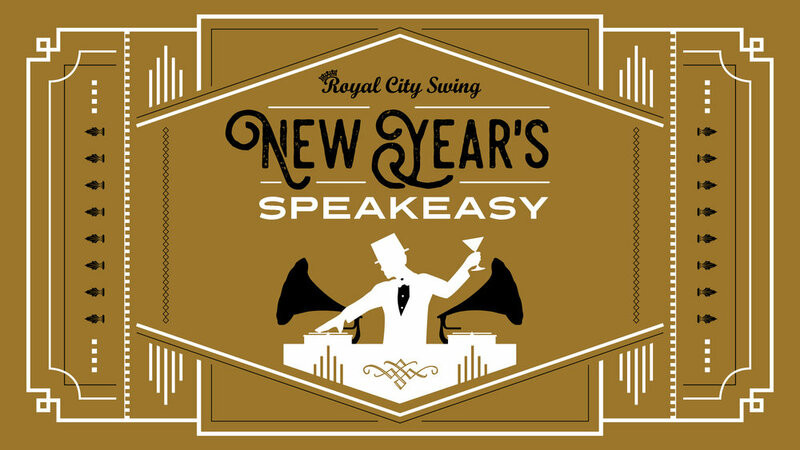 ROYAL CITY SWING'S 2ND ANNUAL NEW YEAR'S EVE DANCE! Save the date for our New Year's Eve Dance with the Palomars! What better way to ring in the new year than with great music, lots of dancing, and all your friends! Mark your calendars now because this is an event you won’t want to miss! This year's theme is Western so start thinking about your outfit! Royal City Swing's 6th Annual Ugly Christmas Sweater Dance! with instructors Afonso and Natsuko. This will also be the last Friday night to buy tickets for the New Year's Eve Dance. $35 cash. Note: Tickets will not be available at the door on New Year's Eve, and there will not be a dance on Friday Dec 30, so don't delay! the 6th Annual Halloween Sugar Push! When going outside for fresh air, we ask everyone to keep their volume down. After 10pm we encourage everyone to exit the back door of the hall, to avoid people being noisy in the front of the building. Those wishing for just cooling down, please walk down the lane to Columbia street or go downstairs in the hall. Royal City Swing presents Deanna Knight and the Hot Club of Mars! Back by popular demand! Floor opens up at 8:30pm for dancing until 11:45 with music from Deanna Knight and the Hot Club of Mars! *Cash only. Pre-purchase dance punch-cards are not valid for band nights. Royal City Swing will be performing and teaching at the Vancouver Dragon Boat Festival for the first time! Come out, dance, eat, enjoy the music, check out vendors, watch the races, and have fun with us! Keep in mind this is an outdoor festival so come prepared! It can be hot, so make sure you have water and suncreen. Royal City Swing will be out in full force at the Sapperton Days Festival again this year! Sapperton Days Festival is an event where the City of New Westminster closes down Columbia Street from Keary to Braid, and local businesses head out to show their wears, foods and provide entertainment. Royal City Swing tends to take over the end of the street closest to Braid having dancers dancing on the street! There is so much planned to make this year great! 5:00PM - Vendors close down for reopening of the street to vehicle traffic. Come out, dance, eat, check out vendors, and have fun with us! Keep in mind this is an outdoor festival so come prepared! In past years it can be hot, so make sure you have water and suncreen. Royal City Swing is thrilled to welcome Kim Clever and David Frutos! The workshop will feature EIGHT classes. Stay tuned for more information, including location. All classes will take place at Royal City Swing's usual haunt, Sapperton Hall on Keary Street in New Westminster (only a couple blocks from the Sapperton Skytrain station). The opening night will take place at Sapperton hall and feature the Bruce James Orchestra! Mark your calendars and be ready for a fabulous weekend of dancing, learning and fun! Learning to harness and redirect the energy created within Lindy Hop. For dancers who are comfortable with their Shag footwork and frame. We will work with Shag Swing Out Style variations and other fun patterns. The latest stuff we have been digging on. Always our favorite class to teach! Inspired by Southern California Lindy Hop Legends. For beginning Lindy Hoppers,or Experienced Lindy Hoppers who want to learn the fundamentals that make Smooth Style so darn smooth. It is not a set of moves that make it smooth, it is a foundation difference that we will go over in this class. Taking the foundation of Smooth Style and adding classic Smooth style moves including the famous Smooth Style Swivels. Tricks to the next level, partner required. Learning to take advantage of your time apart to achieve fun styling moves. Fun easy tricks to impress your friends and family with. David and Kim met in a dark, smokey Swing dance class at a bar in 1994. By 1996 they were teaching Swing dance together at the world famous Brown Derby. It was there that they first learned to teach a class that was both informative and entertaining. Over the years they have honed their skills as teachers in small and large class rooms around the world. As competitors David and Kim have numerous titles together from The National Jitterbug , International Lindy hop, and US Open Championships, just to name a few. They have also been inducted into the California Swing Dance hall of Fame, both individually and as a couple. David and Kim have been in much demand in Hollywood as Choreographers, consultants and performers. Their many credits include: David lynch's Mulholland Drive, Disney's Pearl harbor, Sony's 13th Floor, televisions Everybody Loves Raymond, Brian Setzers Jump Jive an' Wail music video, and the MTV awards. But with all these accomplishments, David and Kim's real passion is teaching and sharing their love of all things Swing. They are known for their humorous and comprehensive teaching style that draws inspiration from Southern California Swing history and has kept them in demand these many years. They look forward to seeing all of you on a dance floor soon! For any items purchased via Swing Tix (link coming soon), there will be a $5 per item price increase if you choose to pay with a credit card. Cash is accepted for all transactions, however, in order to receive the appropriate discount payment will need to be received prior to the deadline. For example, early-bird cash payments must be received by 29FEB2016, otherwise regular pricing will apply. Private Lessons: Kim and David are both available for private lessons outside of the workshop while they are in town. This is not an opportunity to be missed. If you are interested please talk to any of the Royal City organizers, they'll take your name/number down and contact you once the schedule has been finalized. For the dance on Friday, April 29th, Royal City Swing is excited to welcome The Bruce James Orchestra to start the 2016 Dust Up off right! The Bruce James Orchestra (BJO) was founded in 1999 with the mandate of keeping the music of the authentic Big Band era alive and thriving in the Greater-Vancouver area. Since it's inception, the BJO has provided exceptional music in the Tri-Cities/Lower Mainland/Fraser Valley- a tenure of 15 years- and continues to strive to uphold it's mandate. The band performs a variety of big band music from swing, to Latin, to soul to modern power ballads - and most genres in between! The ensemble can be found playing corporate events, non-profit fundraisers, weddings, anniversaries,music festivals jazz vespers, private parties, and our favourite: dances! The Bruce James Orchestra is a group which exudes high energy in our performance, incorporates rehearsed choreography in our musical selections, and is an ensemble which prides itself on excellence inmusical standard, professionalism (both on and off stage), and in providing high calibre showmanship for all its audiences. The Bruce James Orchestra is honoured to perform for Royal City Swing, and looks forward to creating a fabulous musical backdrop for some fancy dancing footwork! ROYAL CITY SWING'S FRIDAY DANCE - SPECIAL EDITION SWING & BLUES! Parking : There is free parking behind the hall or on Keary Street, there is 2hr parking until 8, about half a block west of the hall. There are metered street parking spots to the east of the hall and on Columbia street. With a great group of dancers, a solid team of volunteers and so many talented DJ's and instructors, Royal City Swing is thrilled to be celebrating 5 (read that AGAIN, FIVE) years of weekly Swing dances and two years of monthly Swing & Blues dances! There are a lot of exciting plans in the coming months, more workshops, live bands and more... so come celebrate with us! The Jitterbug Junkies will also be performing!! When going outside for fresh air, we ask everyone to keep their volume down. These are priced at the OLD fee until the cards run out, so be sure to get yours today! The FIRST annual New Year's Eve Dance! Ring in 2016 in your best Tiki attire! There will be live music, drinks, good friends and dancing until the wee hours! ADVANCE TICKET PURCHASE ONLY! THERE WILL BE NO TICKETS AVAILABLE AT THE DOOR! Tickets available for purchase from Royal City Swing, on-sale on Friday, November 6th! As this is an event with alcohol available for purchase, Royal City Swing asks that you plan ahead for a safe ride home. The hall is very close to the Sapperton Sky-Train station if transit is an option. Please do not drink and drive! If you do plan on driving, there is free parking behind the hall or on Keary Street, there is 2hr parking until 8:00PM, about half a block west of the hall. There are metered street parking spots to the east of the hall and on Columbia street. 1st place: $25 Steel & Oak Brewing Co. Gift Certificate and a Gift Certificate for a 4-week workshop series for one ($40 value) and a Royal City Swing t-shirt! 2nd place: Gift Certificate for 2 free admissions for one (up to a $20 value) to Royal City Swing and a Royal City Swing t-shirt! 3rd place: Gift Certificate for a RCS glass water bottle ($9 value) and a Royal City Swing t-shirt! Parking: There is free parking behind the hall or on Keary Street, there is 2hr parking until 8:00PM, about half a block west of the hall. There are metered street parking spots to the east of the hall and on Columbia street. 5th Annual Halloween Sugar Push - Featuring the "DJ José Show"
- Anyone Dressed in Full Halloween Costume (it doesn't count if you're just wearing a mask), get creative! The Columbia StrEAT Food Truck Festival is an event where the City of New Westminster closes down Columbia Street for all the local food trucks to come down and show off their eats! Royal City Swing is thrilled to be a part of the festival for the first time this year! Come out, enjoy more food than you can handle and dance the night away! Royal City Swing at the 12th Street Music Festival! Royal City Swing will be swinging out to the 12th Street Music Festival again this year! The New Westminster's 12th Street Music Festival is a fantastic event, second largest to the Hayak festival, where 12th Street is shutdown from 10th Avenue to 6th Avenue with many stages set up with live bands, shops and food vendors all day! This Year, Royal City Swing will be managing one of the stages (or stage areas) booking our own swing band(s) and providing a dedicated swing and blues section for dancers to come enjoy! All for FREE! Keep in mind this is an outdoor festival, so come prepared! Royal City Swing is thrilled to welcome Peter Flahiff and Lauren Stanley! These two are both so wonderful to learn with and their passion for dance is contagious! The workshop will feature FIVE classes and is geared for intermediate/advanced Balboa/Shag dancers. To get the most of the workshop, it is strongly recommended you are comfortable with the basics in both Balboa and Shag. The good news is there is still time to practice! Peter and Lauren will also be teaching the beginner swing lesson at Royal City Swing's regular Friday night dance on Friday, July 24th... so much awesome! The workshop will focus on Balboa and Collegiate Shag at an intermediate/advanced level. To succeed in this workshop, it is essential you are comfortable with the basics in both Balboa and Collegiate Shag. Shag Technique Upgrades! Lauren and Peter specialize in making your Shag easier and more comfortable than ever, like the dance was originally! In this class, they'll show you tips and tricks to dance Collegiate Shag smoothly and efficiently so you can dance it all night! Collegiate Shag Moves and Movement! Pick up some great material to use on the social floor. Peter and Lauren will share some classic moves from the original Shag era to make you the coolest Shag dancers around! Balboa Technique Master Class! Peter and Lauren are specialists in smooth and efficient Balboa technique that will take your dancing to a whole new level of awesome. Pearls of wisdom from many years of experience will upgrade your style and movement. Balboa Moves and Styling! Lauren is noted in the balboa community for her ability to combine elegant style with dynamic ideas; Peter is acclaimed for his smoothness and ability to take standard moves and make something fresh. This class will give you insight into all of this! Integration! In this class, Peter and Lauren show you how to seamlessly and fluidly transition between ALL your swing dancing: Balboa, Lindy Hop, Shag, East Coast Swing... All in one song? ABSOLUTELY. On SAT / 25JUL, Doors will open at 9:30AM. There will be TWO dances, the first will be Royal City Swing's regular Friday night dance. Private Lessons: Peter and Lauren are both available for private lessons outside of the workshop while they are in town. This is not an opportunity to be missed. If you are interested please talk to any of the Royal City organizers (Afonso, Nicola & Natsuko), they'll take your name/number down and contact you once the schedule has been finalized. Royal City Swing presents The Jen Hodge Quintet! Floor opens up at 8:30pm for dancing until Midnight with music from The Jen Hodge Quintet! Come out and dance the night away to the swingin' sounds of the Jen Hodge Quintet! Floor opens up at 8:30pm for dancing until 1:00am with music from Deanna Knight & The Hot Club of Mars! Just like a regular Swing / Blues night, the music will transition from swing to blues between 10:30 and 11pm. The dance floor keeps moving with blues music until 1am! Be sure to dress in your vintage-swing attire to celebrate Royal City Swing turning FOUR! Floor opens up at 8:30pm for dancing until Midnight with music from The Palomars! Dress in your rockabilly finest... take high energy rockabilly and mix it with some uptown hillbilly jazz and you'll snap your fingers and shuffle your feet all night long. ROYAL CITY SWING PRESENTS STEVE COOMBE'S HOT FIVE! Royal City Swing is especially excited to be presenting Steve Coombe from London England! Beginner Lesson downstairs starts around 7:45pm till 8:30ish,Floor opens up at 8:30pm for dancing until Midnight with music from Steve Coombe's Hot Five! - Students attending the Live Band Musicality workshop! Advanced Tickets can be purchase at the discounted rate for just the dance, OR $20 for both the Musicality workshop and the dance! Tickets can be purchased at Royal City Swing, or by contacting Royal City Swing (royalcityswing@gmail.com) to arrange getting tickets from organizers. European Swing Dance Championships in London and Barcelona, Herrang Dance Camp in Sweden, Swing Crash in Como, Harlem in Lithuania, Smokey Feet in Amsterdam, Swingin Spring in Gothenburg, Paris Jazz Roots, Lindy Shock in Budapest, London Swing Festival. Tenhola Dance Camp in Finland, Winter Jump in Norway, Rock That Swing Festival in Munich, Shout Sister Shout in Rome, Goodnight Sweatheart in UK, Be Lindy Zena Camp in Italy, Shout and Feel It in Bologna, Camp Savoy UK, The Mooche in Ireland and Swing Cite in Belgium. Also lindy exchanges in Zurich, London, Paris, Cambridge, Dublin and Copenhagen." Royal City Swing Swings out at 12 street Music Festival, 2014! Royal City Swing will be swinging out to the 12st Music festival again this year with increased presence and festivities! Live Band! Performances! Free Lessons! Prizes! The New Westminster's 12th Street Music Festival is a fantastic event, second largest to the Hayak festival, where 12th Street is shutdown from 10th Ave to 6th Ave (that's 14 blocks!) with many stages set up with live bands, shops and food vendors all day! Detailed schedule and band to be announced soon! Here's the tentative schedule: - SUBJECT TO CHANGE! 11:00 am - Festival opens! 11:30 am - Shim Sham Flash Mob! 2:00 pm - Shim Sham Flash Mob! Like cars? Like dancing? Like live music? Like summer street festivals? Well, we have good news for you! This year, Royal City Swing is participating in the Key West Ford Show n Shine in a significant way! Royal City Swing is managing both the teamster's mobile stage, as well as the entertainment east of 4th on Columbia! 11:00 am - Performance by the Jitterbug Junkies! 12 noon - Free Lesson! 1:30pm - T. Riley's first Set! 3:30pm - T.Riley's Second Set! So Save the day, and come help us promote swing dancing, enjoy the music and the festival, and dance the whole day! Royal City Swing's Balboa Ball! The dance will be a regular Royal City Swing Friday night dance with an east coast drop-in lesson, but the dance will have an out of town balboa DJ playing balboa friendly music through the night with our own DJ playing the kinds of music Royal City Swing is famous for! FREE for those participating in the Vancouver Balboa Mini-fest. Royal City Swing will be out in full force at the Sapperton Days Festival again this year! DJ's K-While and Afonso will be playing music from our booth, dancing around the event! Come look at Nicola's Car! - A performance from the JitterbugJunkies! 4 pm - Shim Sham Flash Mob! 5 pm - Vendors close down for reopening of the street to vehicle traffic. DJ'd music will be played from 10am - 5pm! DJs: Afonso, K-while and more! Royal City Swing is excited to have:- A performance from the JitterbugJunkies!- Shim Sham flash mobs- free lessons- prizes!Sapperton day festival runs from 10am - 5pm:10 am - pancake breakfast11 am - offical start of the street vending12 noon - Free lesson1 pm - DC shim sham flash mob2 pm - Performance by the Jitterbug Junkies3 pm - Free Lesson4 pm - Shim Sham Flash Mob!5 pm - Vendors close down for reopening of the street to vehicle traffic.DJ'd music will be played from 10am - 5pm! Royal City Swing Celebrates Frankie 100! May 26th, 2014 will be Frankie Manning's (one of the founding father's of Lindy Hop, and swing dancing) One Hundredth Birthday! The global lindy hop community is going to be celebrating! Vancouver and the lower mainland venues have gotten together to mutually promote 4 nights of amazing dancing. Royal City Swing's participation in this event will be a Frankie style Lindy Hop competition on the Friday night! Details will be coming out soon! Competition will begin between 9:30 and 10 pm. We are having the floors re-finished, and we can't wear shoes in the hall for a week, so.... SOCK HOP! We will be providing Socks if you aren't comfortable dancing in your own socks! Royal City Swing is celebrating 3 years of weekly Swing dances, half a year of swing and blues dances, the 3rd annual Valentines dance and our second band: the Soft Winds Quartet Featuring T.Riley! Band: Soft Winds Quartet featuring T. Riley! The evening will begin as usual with our beginner drop-in swing dance lesson from 7:45 to 8:30 pm. Then the Soft Winds Quartet featuring T.Riley will take the stage playing fantastic swing music until 10:30 pm. The band will take a bit longer break in order for our drop-in blues dance lesson from 10:30 to 11pm. While this blues dance lesson is going on, there will be DJ'd swing and blues music from until 11pm. Then the Soft Winds Quartet featuring T.Riley will take the stage again playing blues dance music! Blues dance music will continue until 1am. It's Valentines Day, so wear Red, and dress to impress! When going outside for fresh air, we ask everyone to keep their volume down. We don't want the police being called! - Royal City Swing Dance Lessons for 2! - $50 Tim Hortons Certificate! 1st: Mattius and Florence, 2nd: Christina and Ted, 3rd: Greg and Elena! Royal City Swing and Rhythm City Productions are joined forces to bring you a two-night dance competition and party! It's a Jack & Jill, a comp where you don't need a partner, you just sign up and we give you one! Jacks & Jills mix it up, have a lot of fun, and win some awesome prizes! Preliminary round was held: Friday December 6th to Royal City Swing's night. And Finals were held: Thursday, December 12th for Rhythm City's Blackstick CD Release Party at Rhythm City Strut's Holiday Dance! Third Annual Halloween Sugar Push! - Royal City Swing T-shirt! - $50 Tim Horton's gift card! -Free admission to Royal City Swing regular Friday night dance for two! Royal City Swing DJ: DJ SUPER and K-While! All Ages Dance – No Partner Required. Free Lesson Starting at 7:45pm. One block west of Sapperton Skytrain Station. Free Parking at the back & street. Featuring Glenn Crytzer and his Syncopators! After 2 years of Royal City Swing, we will have our first band performing for our dancing pleasure! And not just any band either! Glenn Crytzer and his Syncopators from Seattle! Glenn and his Syncopators have been performing all over the US and Canada! Doors open at 7:30pm and Beginner Lesson starts around 7:45pm till 8:30ish, Floor opens up at 8:30pm for dancing until Midnight with three 3 sets of great swing music from Glenn and his Syncopators! Beginner lesson starting at 7:45pm, no partner required! The 2nd Annual Christmas Swing Dance! - $50 Keg Gift Certificate! - Sparkling Wine, Chocolates & more! - Dressing in full Christmas costume! Free Lesson Starting at 7:30pm. Laura & Michael as "Zombie Red Riding Hood & the Big Bad Voodoo Daddy"
Elisabeth as "Sally from Nightmare before Christmas"
-Admission for 2 for Royal City Swing’s New Years Eve Swing Out Party! -Lindy Hop Series Lessons for 2! -Best Costume Ever Contest Trophy! -Admission for 2 to Jungle Swing. Royal City Swing DJ: DJ Jose!